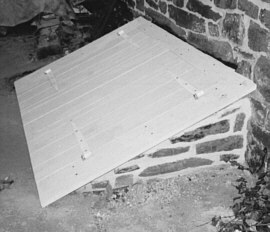 S&E Construction of Greenlane, PA was the contractor who conducted the restoration of the bulkhead doors. The project was funded largely by a grant from the Montgomery County Housing and Community Development Program. Approval for the project was obtained from Evansburg State Park, Department of Environmental Resources; The Bureau of Historic Preservation, Pennsylvania Historical and Museum Commission; The Federal Advisory Commission on Historic Preservation; and the Skippack Township. Project Documentation was prepared by Mark Hornbaker and Debbie Vilar, June, 1994. Restoration of Cellar Bulkhead Doors on the west exterior wall of the IndenHofen house. 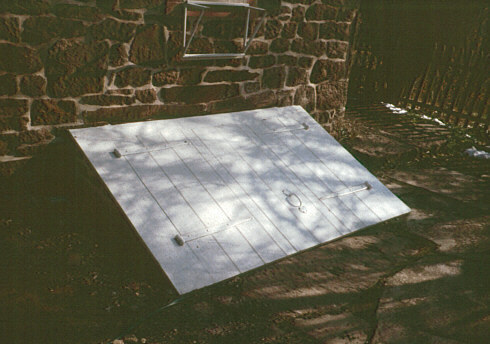 The bulkhead doors, as they existed prior to this work, dated to probably the mid twentieth century and were not appropriate for the late eighteenth century (approximately when the later addition of the IndenHofen House and the bulkhead entrance date to). In addition, the bulkhead doors were in bad disrepair and presented a security risk as well as allowing water to infiltrate. It was necessary to replace the doors with ones more suitable to the time period being interpreted. During the course of the work, it was found that the masonry walls supporting the door frame were in poor condition as well. After the bulkhead doors were removed, the walls were demolished to about grade level and then reconstructed. Once the masonry support walls were completed the bulkhead doors and frame were constructed. While the exposed exterior face of bulkhead doors were constructed to fit with the late eighteenth century, no attempt was made to disguise the unseen inside faces. One reason for this is that visitors will not have access to the cellar and therefore will not see the inside faces of the doors. A second reason is that by using modern methods (carriage bolts, nuts, screws, etc.) to construct the doors, the doors can be easily disassembled for repairs, etc. Several discoveries were made while this work was being conducted. The handle on the previous bulkhead doors appeared to be eighteenth century and the outline of this handle matched ghost lines in a surviving original door in the house. It would seem that as the house was upgraded in terms of hardware, the outdated handles were used outside. A second handle matching the first was found on one of the doors to the threshing floor of the barn. The handle from the previous bulkhead doors was simply re-used on the reconstructed bulkhead doors. 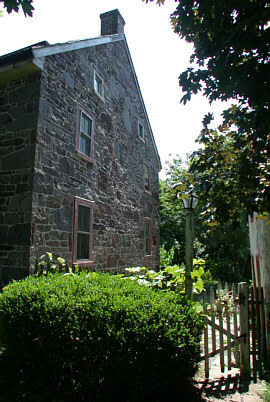 A second discovery was historic, if not original, pointing on the west wall of the later addition of the IndenHofen House. 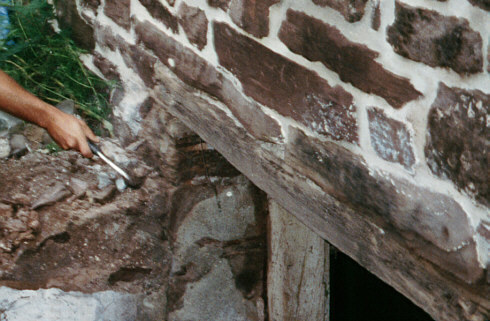 In the mid-1980's, the IndenHofen House was repointed and all historic pointing was seemingly lost. However, when the bulkhead masonry support walls were demolished to grade level, a portion of the west wall below grade was revealed. Historic, possibly even original pointing still existed, protected by being under grade. Lastly, while the masonry support walls were being demolished, a cut spike was found inside the wall. Cut nails date at earliest to circa 1797 and one would not expect to find a cut nail in a bulkhead support wall which supposedly dates to roughly 1783. The presence of this cut nail would seem to put in question exactly when the bulkhead doors were constructed. It could very well be that originally there were no bulkhead doors present, simply an exterior staircase that descended to a vertical cellar door.